You will vote on HB 435 this week – for the second time. When you passed HB 435 through to Finance in January, the bill may have looked like a proposal to use up a little extra appropriation in the charter schools account. Now it is clear that HB 435 is a much bigger step than that. Supporters argue that this surge in funding could be paid for out of the adequacy funds. But adequacy funds for 43 communities are already capped (here’s a list). Dover alone is $1.8 million short. Salem, $1.5 million. Stratham, $743,000. Exeter, $507,000. Fast growing Bedford and Windham are capped at about half their adequacy funds. And New Hampshire already does far less than most other states in getting aid to students in Berlin and other property poor communities. These towns will not agree that adequacy funds should be taken from towns losing students but withheld from growing communities. 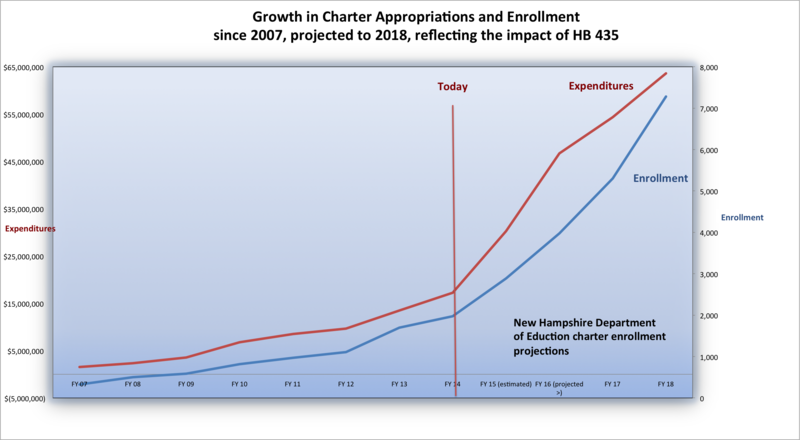 So HB 435 raises big questions about whether New Hampshire should fund a fast-growing new system of charter schools out of the state’s scarce revenues. As a practical matter, this funding decision is irreversible once schools begin relying on these funds. So the Finance Committee recommended interim study (a real study) 13-8. I believe the Legislature should support this recommendation and allow a responsible review of the State’s charter school funding options. Here is the detailed information on HB 435. By ANHPE in Bills, Charters in NH on March 17, 2014 . Good to hear from you, Rose. I look forward to discussing competencies with you. No discussion with Fred Bramante goes far without a reference to your important work. As to Milgram/Stotsky, I don’t actually know. But Dr. Stotsky is affiliated on an emeritus basis with a Walton Foundation funded “school choice” type academic department in Arkansas, fwiw. And there are tea party groups all over the country that, I’m sure, can come up with money for airfare. I have no reason to think they are being paid beyond that. Dr. Stotsky was awarded a chair in “Teacher Quality” at the University of Arkansas by the Walton foundation. She was one of 14 at the time in various fields of endeavor. At the time K-12 accomplishment ratings had Arkansas rated number 48 out of 50. Her charge was to improve teacher training throughout the state of Arkansas and continue her influence throughout the country on the back of her success in Massachusetts. The teaching standards and teacher qualification improvements that she spearheaded in Massachusetts under Republican Governor Weld, and Massachusetts State Senate leader Democrat Thomas Birmingham created the highest in the country. They have been copied by many states who believed these standards written by two Harvard Law graduates were favorable to the children in their state and not private industry or others. They were initially given a very hard time by an extremely liberal state legislature clearly in the bag of teachers unions. Turning point was a Governor Weld idea that forced change in the relationship between property tax amount and quality of education in rural communities. He claimed it was unconstitutional. They had created an unethical fraudulent advantage to wealthy towns and cities and communities. They forced the state legislature, much to its dislike, to balance its state aid to favor poorer communities in the inner city and rural areas. That department is founded on ideology, not academic rigor. But you do seem to know a lot about Dr. Stotsky. I can’t tell from her resume what articles she has published in juried academic journals. Can you help me there?